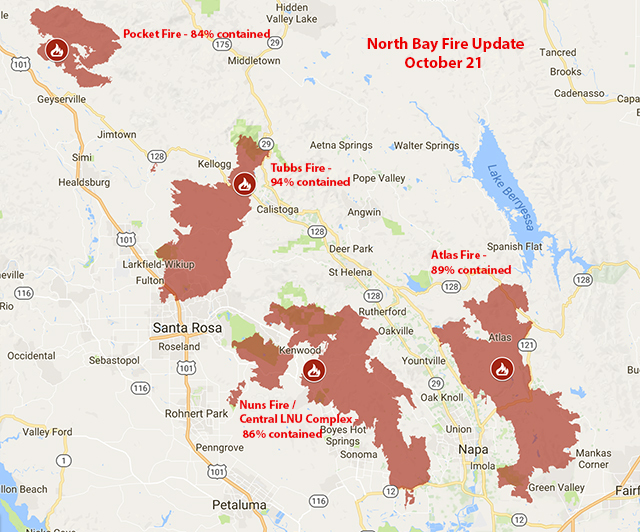 Almost a full two weeks on, the Atlas, Tubbs, Nuns, and Pocket fires continue burning in Napa and Sonoma counties, though significant progress has been made over the course of this week on containment. The Redwood Valley Fire in Mendocino County stands at 95% contained after burning over 36,500 acres, and to the south, the Bear Fire in the Santa Cruz mountains, which began on Monday night, is 50% contained. A total of nine major fires are still burning statewide, and over 8,000 firefighters are working to change that. The New York Times just published this intense map, of the hour-by-hour progress of the Tubbs Fire on October 8, showing exactly where each of its 22 victims' homes were in relation to the fire's movement. The Tubbs Fire is now 94% contained after burning nearly 36,800 acres in both Sonoma and Napa counties, and destroying at least 5,300 homes, making it officially the most destructive fire in state history. The Pocket Fire, in northern Sonoma County, is now 84% contained after burning over 17,000 acres. The Nuns Fire, which subsumed a number of smaller fires over the last two weeks including the Partrick, Adobe, and Oakmont fires, is now 86% contained and has burned 56,200 acres in Sonoma and Napa counties, destroying at least 1,300 structures. As Cal Fire announced Saturday, the Atlas Fire is now 89% contained after burning over 51,600 acres in Napa County, and destroying 741 structures. Per their statewide summary, "Firefighters continue to strengthen perimeter control lines, provide structure defense and engage in tactical patrol[s]" with regard to the Atlas Fire. And, Cal Fire cautions residents who are being allowed to return to their homes, "Please drive carefully as emergency personnel are still working throughout the fire area." The Nuns Fire is now number 6 on the list of the 20 most destructive fires in state history, and the Atlas Fire is now number 10.